NEW YORK--(BUSINESS WIRE)--Wake up and celebrate National Coffee Day on September 29 with a cup of Tim Hortons® coffee. From September 29 to October 8, participating Tim Hortons® Restaurants across North America will be giving away up to a million free Original Blend, Dark Roast, Decaf or Iced Coffees, of any size, to Guests who download the Tim Hortons® Mobile App and activate their account to redeem their offer. By using the Tim Hortons® Mobile App, Guests will be able to select and pay for their order before picking it up in-Restaurant, without having to wait in line to order or in the Drive-Thru. Much of the standard Tim Hortons® menu – from delicious breakfast sandwiches to signature Timbits®, the bite-sized morsels of our traditional donuts – will now be available on the App so Guests can easily enjoy their favourite staples and also try something new! The Tim Hortons® Mobile App is available to download on the Apple App Store and Google Play Store. Each App user will be eligible for one free* coffee after downloading the App and activating their accounts, at participating locations in the U.S. and Canada, while supplies last. Activating an account requires loading a minimum of $10 into the account (local currency applies) or making a purchase using the App. The offer can only be redeemed through the Mobile App. One offer per Guest, for one-time use only. Please contact your local Tim Hortons® restaurant to confirm availability. Guests can join the National Coffee Day conversation with Tim Hortons® by tagging @TimHortonsUS on Facebook, Twitter, and Instagram and using #NationalCoffeeDay. OFFER DETAILS: Valid for one (1) any size Original Blend, Dark Roast, Decaf or Iced Coffee. One redemption per guest. Not valid with any other coupon, discount or offer. 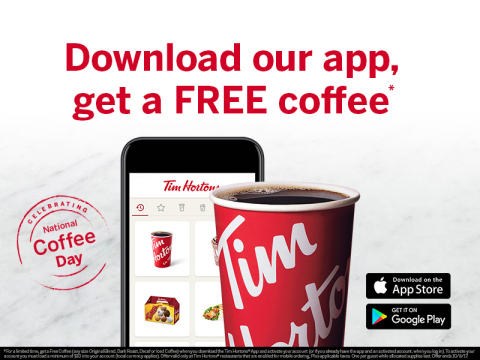 Can only be redeemed through mobile ordering when you download the Tim Hortons® App and activate your account (or if you already have the app and an activated account, when you log in). To activate your account you must load a minimum of $10 into your account (local currency applies).This offer is not redeemable at all Tim Hortons® restaurants and participation may vary by restaurant. Void where prohibited. Plus applicable taxes. No cash value. TM & © 2017 Tim Hortons. All rights reserved. Offer valid while allocated supplies last. Promotion ends 10/8/17. TIM HORTONS® is one of North America's largest restaurant chains operating in the quick service segment. Founded as a single location in Canada in 1964, TIM HORTONS® appeals to a broad range of consumer tastes, with a menu that includes premium coffee, hot and cold specialty drinks (including lattes, cappuccinos and espresso shots), specialty teas and fruit smoothies, fresh baked goods, grilled panini and classic sandwiches, wraps, soups, prepared foods and other food products. TIM HORTONS® has more than 4,600 system wide restaurants located in Canada, the United States, and around the world. To learn more about the TIM HORTONS® brand, please visit the TIM HORTONS® brand website at www.timhortons.com or follow us on Facebook, Twitter and Instagram. Restaurant Brands International Inc. is one of the world’s largest quick service restaurant companies with more than $28 billion in system-wide sales and over 23,000 restaurants in more than 100 countries and U.S. territories. RBI owns three of the world’s most prominent and iconic quick service restaurant brands – TIM HORTONS®, BURGER KING®, and POPEYES®. These independently operated brands have been serving their respective guests, franchisees and communities for over 40 years. To learn more about RBI, please visit the company’s website at www.rbi.com.